SKB has commissioned a new ship to ferry used nuclear fuel and radioactive waste from Swedish nuclear power plants to storage facilities near Oskarshamn and Forsmark. Svensk Karnbranslehantering AB (SKB) - the company responsible for storing Swedish nuclear waste – currently uses its M/S Sigyn vessel to transport used fuel and waste. 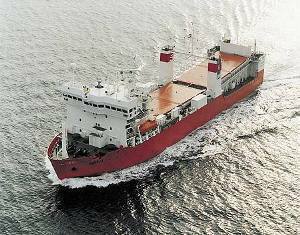 The 90-metre long ship, capable of carrying ten containers, was launched in 1982. Whilst owned by SKB, the Sigyn is staffed and operated by Rederiaktiebolaget Gotland. SKB's board of management considered two alternatives: a renovation and refurbishment of the Sigyn or the construction of a new purpose-built ship. After reviewing the options, the board opted for the latter. The company said that following a procurement process for a new ship it has now signed an agreement with the Damen Shipyards Group of the Netherlands to build the vessel. The new 99.5-metre ship – expected to be launched in 2013 – will feature six small, fuel-efficient engines and will be equipped with catalytic treatment for optimum fuel economy with minimum environmental impact, SKB said. It will be capable of carrying 12 containers. Until the new ship is completed, SKB will continue using the Sigyn to transport used fuel and waste. SKB president Claes Thegerstrom noted, "Since the early 1980s, the M/S Sigyn has operated in a safe and efficient manner. She will do so for a number of more years."